What is Winamp? A play­er you say? No, no baby. Winamp is much more than that. Winamp is a lifestyle. It is freestyle. Give me a word. Ver­sa­til­i­ty? Yeah. Vision­ary? Of course. Com­mu­ni­ty? Now you’re talk­ing. Winamp lives because it’s users have a life. 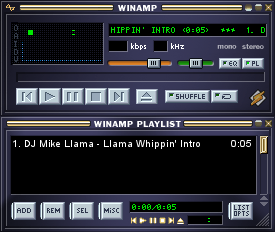 Winamp is in the cof­fee house. On the lap­top. Of the guy. Who is writ­ing the screen­play. That you will be watch­ing next year. Winamp is on the screen. In the club. Where the DJ plays the tracks. That get you through the night. Winamp is with you. When you take your playlist. Push it to the ether. And share the music that you love. With all of human­i­ty. Winamp lets you put togeth­er the sound­track. That runs in the back­ground of your mind. And allows you to define your life. Winamp is your skin. Allow­ing you to look and feel the way you want. Winamp is what it is and noth­ing more. But you are the one who makes it. Winamp is there for you. It is yours. What hap­pens next? You tell me. Down­load Winamp. But in real­i­ty, that’s all it did. Or was there more? Give me a word. Hyper­bole? Maybe. Awe­some? Unde­ni­able. Next Next post: Firefox Miami Style?